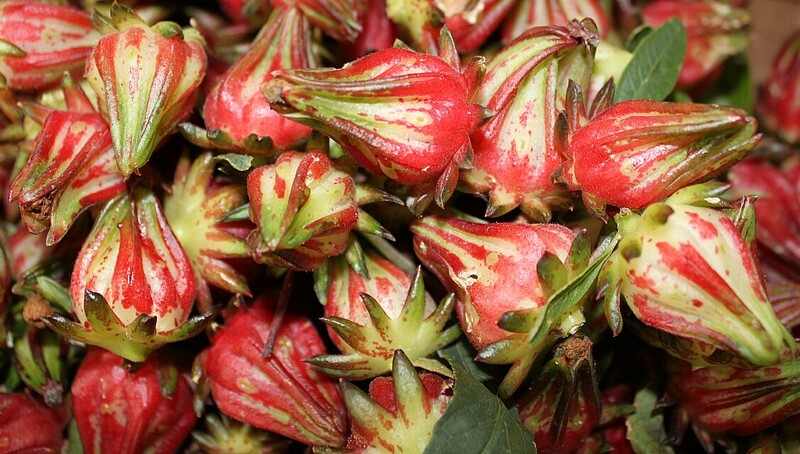 I was surprised to discover that rosella, or roselle (Hibiscus sabdariffa), is pervasive throughout Zambia because it was originally a species of hibiscus native to the west of Africa. A self-seeded rosella plant in our garden. Then a Zambian friend told me that rosella, known in some of the local dialects as lumande, was long ago smuggled in from Angola, our western neighbor, after it was listed as prohibited for being highly invasive. The legend goes that a young woman from the Luvale people, a tribe that straddles the border of both countries, so coveted the rosella seeds she unearthed in Angola, she plaited them into her hair where no one would find them when she crossed back home to Zambia. That it was invasive is without question: rosella is now to be found growing in most gardens the length and breadth of this country. The native Zambians love to eat the plant’s peppery leaves, which they fry or boil together with fish or chicken, usually combined with a tomato and onion relish. It’s a great accompaniment to their traditional staple, nshima, or maize meal. Just-picked young rosella fruits before being left in the sun to dry. Like so many wild edibles, rosella is filled with goodness. It’s brimming with phytochemicals, and is held up for its antihypertensive and antioxidant properties. Chris and I find a rosella tea infusion, which steeps into the color of claret, very comforting. We drink it either hot or cold. On its own rosella is puckery so we add a teaspoon of honey, while mint, ginger and lemon juice are all terrific additions. It also makes a tasty, firm jelly, which we like to eat with lamb, as well as a syrup for desserts and a molasses. I will be sharing these rosella recipes with you in later posts. 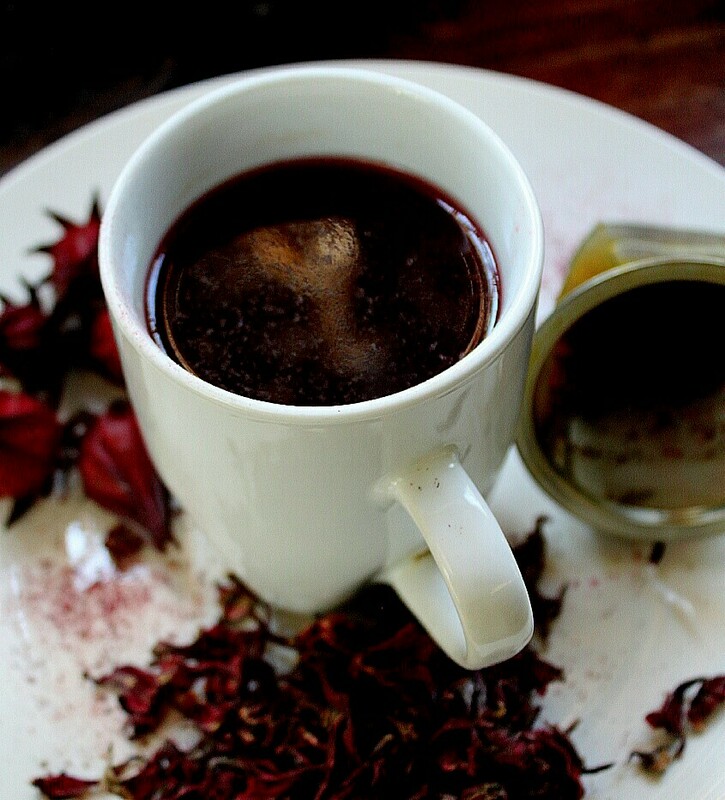 Rosella tea with wild honey. Different species of rosella–also referred to as roselle, wild hibiscus or Jamaican sorrel–are grown and used in cuisine in the Caribbean, Latin America, the Middle East, Australia, Asia and throughout most of Africa. As a child I spend many school holidays with my grandparents in Zambia. i have fond memories of Rosella jelly/jam that my grandmother used to make for us. Yummy! Hi Di … it’s actually imported to Europe and the United States for creating food coloring. So yes, it does make a good dye! There is nothing better than Rosella Jelly for Pork dishes or even Turkey. I have always been curious about the plant as I am not familiar with it. Thanks for the info Annabel. I actually do not mind eating it every day on my meals with Nshima and fried or dried fish. I like the rain season the most as that is when it grows uncontrollably.